I collected my thoughts regarding the past and future of the OSCEdays. First analysis. Second my ideas for the future. When OSCEdays was started less than two years ago one of the goals was to establish its question in the global discourse. I think it is fair to say, we managed to do that with all our partner cities across the globe and other organisations picking up the question. Also it is a fantastic gift that we now have this community – a committed Board Of Stewardship and many local actors interested in continuing their work. When we started their were no examples for Open Source Circular Economy. So we made the event a hackathon. A hackathon is an event where people create things through hands on action – let’s invite people to create OSCE. But I think it is fair to say, that did not work, so far. The question is too complex, we ask too much, and give to little guidance. Most people are already busy enough to get ‘Circular Economy’. ‘Open Source’ is a complete riddle to most. And we even ask them to develop Open Source progressively forward because outside of software no one really has a good clue what Open Source could mean there. And we ask them to do all of this at once … Way too much. Also and maybe for that reason the whole documentation part and online communication around the event did not really work well. We don’t know for most cities what was happening. Here and there reports come in. But not to the intended level. I think “run the event you like on the subject of OSCE” isn’t enough to get the productive actions and connections going we hoped to see. We established a global discourse about OSCE but I am not sure how productive and interesting the talking was so far. When I onboarded cities I often got asked about clear methodologies. Our answer was complete freedom. But I think we should also offer clear recipes for action – like standard challenges – or “Action Modules” to pick up locally in an event or whenever. Research one local circular material (look for these steps and criterias) and add it to this data base. Create and publish a tour-map to circular spaces in the city. I think, you get the idea. Clear and interesting steps. Almost as simple as Board Games. It should be simple and fun. And following the steps people will experience OSCE while they are doing it. Real understanding can follow from that. The exact template and catalogue of criteria is to develop in the coming weeks. 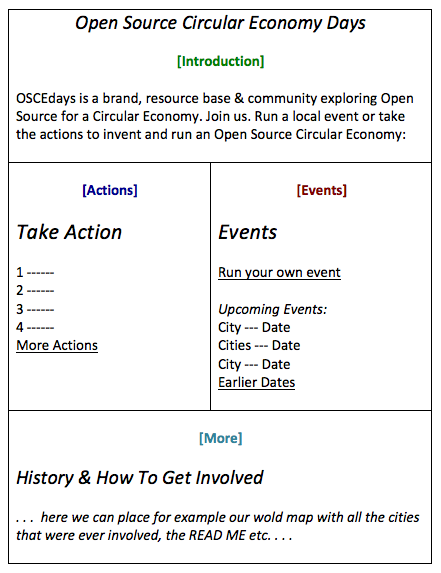 OSCEdays would be a growing collection of recipes for action and documentation following from that and an invitation to run an event with the recipes any time. The website could teaser some recipes and show a list of upcoming local events. Everyone can add an event, run one in parallel to another one for example and connect to it – following the action recipe “create global connections” for example. This is how the website could look like then. You see, it is different from just an annual event. That way we can get in more permanent action. We still can run one global event where we try to reach out to many people, if we think it makes sense. Given our resource situation we decided a while a go to postpone the building of an own organisation for OSCEdays. @djcoco already shut down everything that was on the road. We have a little money left and will probably need a legal entity to handle something here and there. I suggest we ask the CRCLR e.V. here in Berlin. They are very into the OSCEdays. And maybe for a small fee for each transaction they can handle our money for us. I suggest we brainstorm this in one of the future BoST calls before we write something down. What are the next steps. We need to agree on a future strategy – maybe the one I suggested above. I offer to rebuild everything – adjust the website, forum, READ ME etc. to the new strategy and come up with drafts for a standard template for the action recipes and first examples. All of this with your (BoST and interested Community Members) constant feedback. Sam @cameralibre will help with that – with the operational work. I talked to Sam. We both have some time for it and an interest to do it. But we would need some payment for it out of the money that is left. I am happy to invest most of my September and October to the task and I am able to do also some work for free (because I had some good paying jobs) but not all it. Let’s discuss this in a future BoST Call. I am pretty excited about the new plan. And I think it will recharge my whole motivation. And I see already so many possible uses for this new strategy in the foreseeable future. It connects perfectly to the other projects in the next months. It for example would work great with the DIF collaboration. I wrote a proposal about that here as well. Don’t miss it. It can explain the strategy a bit more. How to scale up OSCE approaches? I have read and I find it very interesting what you propose for the future of OSCEDAYS. I believe that what has been done so far has not been lost in any way, and instead (as many of the design process, which is the subject I know and work) always necessary to rethink and re-start analyzing what happened always looking do things in a more adequate way to present situations. from the perspective of someone who is on the other side of the world and has not been so linked to the organization I would like to give my view on how we see here the OSCED event and how they have perceived the event who have participated in the here, it is Perhaps this will serve to the process of global OSCED organization. the open source and circular economy are two subjects that very few managed in our country. not normally found projects involving much less any 2 together. it is possible that theme in many cases projects are being copied from others who have already been developed abroad and applied to the needs of the territory. on the other hand, too many projects that really do not apply circular or do very superficial way to take advantage of the publicity is done now what are sustainable economy. It is why in our case we wanted to differentiate the activities into 2 types. workshops and lectures: in the talks what is sought is to bring to the public, experts and those who in some way have developed projects that can even be considered that are part of any of these two thematic and serve as an excuse to talk and teach people on these two issues. in the workshops we seek to develop joint projects with volunteers and companies or entities that provide the opportunity for such projects can be carried out as an experiment, proposed or possible potential project that serves not only to discuss the issue but to put in practiva and to assess it. the consumer, volunteer or citizen: as conjugator executor of ideas and models, final evaluation of what is proposed. besides this, we look for each meeting of based on a fundamental axis, as has been food, environment, technology, economy etc. so that the theme developed not so open to miss a bit the theme and the end is not known about it was working. 1-Cities do not interact with each other (much as they should do) or during the organization of the event or during the event. 2-platform community is not used as the valuable tool that it is. not all cities use it and not all actually updated or upload information. 3-participants do not use the database or load the results, often making information and miss valuable development. 4- one week is little time to develop some projects. 5-some participants expressed that it is not clear how the global organization supports local events. the first is quite general but I think that OSCED Global should give minimum parameters that allow each city perform activities within a thematic that routed and activities which in a way are mandatory. 2- not if possible but somehow every city should upload information from time to time or fulfilled every stage of development of a project to keep the information for everyone. 4- global activities should be developed in stages throughout the year, for example oscedays week should be for the presentation of results of what was developed during the year and to launch activities to be performed in the next period, also allowing other meetings global to develop different stages of each project. 5-OSCED globally should be displayed as an essential part in each local event. make clear the important work being developed for these events can take place. this is only a summary and without delving much, but I hope it will at least make it discussed by others and thus not be taken into account at least generate a dialogue. i´m try to answer your proposed activities once make a deeper analysis of these. and thanks to @RicardoRug, for Feedback! I think 2 years has been a good period to get a feel of where OSCE Days might head. We have seen that there are certainly strong enthusiasm. The next step is to harness the enthusiasm, increasing brand awareness and take it to the next level. We had a vision of introducing the powerful combination of Open Source along with Circular Economy. Why did DIF contact us? I think they see that the commons is going to be an important part of the circular economy equation. This is where the force of the people is. The first 2 years were like the formative years of this movement, but I think it’s time to reach the next phase of development in the maturity of this “movement”. I think it is helpful for everyone involved to go back to the roots and ask ourselves this self-reflective question: “Where do we see the strength and value of the combination of Open Source and Circular Economy?” Unless we all know where the power of this is for scalable transformation, we won’t have harnessed the power of this growing movement. For myself, my own project is going to align with what @RicardoRug said…we will now be working all year round on the various technology projects related to the design and building of our local Open Source Circular ecohome, with all designs to be made available here. This is an attempt to turn this platform into a colaborative tool we use year round. And then, when the 1 week event comes along, we share the progress of all our work during that week. I think that this is a necessary step in our evolution.The platform is there, we just need to start using it as a sustainable, year round collaborative tool. Of course it has limitations, but those will come out as we put it to practice. I think that for us to scale and have real impact, we have to move beyond a “one week event” into a full-time network that supports and amplifies collaboration amongst the commons. So this also implies we need to find ways to facilitate global cooperation between people in different parts of the world. It should be a meeting place where ideas can flow seamlessly and exchange for the betterment of all of us in the commons. In this way, we can amplify good work globally. The steps Lars laid out are in this direction of creating a repository of definite projects and definite knowledge that can be shared for everyone’s benefit. It gives us a starting point for everyone else to weigh in and refine this idea. My two cents: Lars I think your diagnosis is very accurate, and in order to move to an action community you clearly need actionable projects showcased and made visible all over. You’re right in that most people - hosts but also participants, are busy. Period. And so having one challenge and mobilizing around it would be very clear, timebound and allow event participants to self-select without showing up and taking a lot of time to understand how OSCEDays fits with their work. From my experience in Sibiu, I think especially the last two challenges you listed would work in a future event and would bring people who are closely aligned together rather than a mix with too big a gap of understanding to actually get down to produce things collaboratively… I remember someone in our event asked why we spend so much time talking about open source, and how he wants to move to circular economy exclusive aspects. He had a few hours in a day to dedicate to OSCEDays and nothing more. Last remark is related to what Ricardo wrote above about making the global-local connection more visible. You may consider collaborations to span across the different locations. That I think is the underlying piece which then has effects on how people use the platform etc. “Take Action” as a primary section on the new website would somehow need to allow people to have a common conversation and not just do away with resources at the local level. The collection of all the results will never be as strong a narrative as something we produce together as a group. For example if a local group is taking Action x, then it’s worth putting out regular calls in the broader network introducing the people (faces and local geographies) + action (the work they are doing) + call for action in your city (this can be replication, mentorship, partnering up for a related product design, or funding application etc). This can make it easier for local nodes to become multipliers because the info is already packaged, they can give it a shout out… and then you have network effects and a bigger chance at a flagship project spun out of collaborations where you can show a very concrete path to products/ results. I know it’s easier said than done… but keeping people very motivated in being together I think solves some of the other coordination issues. My apologies. You are right. It is definitely not a “fail”. This would not put enough value on the incredible things that have been done. I think I personally hoped for more - and now let’s try to push it for more, building on top of what is there! It sounds really interesting what you are doing and I imagine working in this field is even harder. So we can learn a lot from your approach! I share completely your analysis in 1-5. And my new ideas try to tackle this much like yours - an “Action Recipe” would always include documentation as mandatory or even fundamental. You could write it down or join our discussion in the BoST Call next monday (Sept. 5) 11am GMT - as anyone else interested can do, always. And I am curious how you will use and push the platform when using it for your ecohome project. That sounds very interesting. “Take Action” as a primary section on the new website would somehow need to allow people to have a common conversation and not just do away with resources at the local level." The collection of all the results will never be as strong a narrative as something we produce together as a group. For example if a local group is taking Action x, then it’s worth putting out regular calls in the broader network introducing the people (faces and local geographies) + action (the work they are doing) + call for action in your city (this can be replication, mentorship, partnering up for a related product design, or funding application etc). I just exhibited OSCE Days and SRG Open Source Circular Ecohome project at the Mini Maker Faire this weekend. I couldn’t bring our wind tunnel down to it,…was way too big but we brought pictures of the ecohome, the list of the various technologies we are incorporating and we got amazing response. People are dying to work collaboratively on this kind of stuff. There was a steady stream of people who signed up to participate…from research scientists, people who develop technologies for the city, people building their own ecohomes, programmers, people with social and community projects…So I’m getting all these people to our OSCEDays website to sign up so that we can now start doing working together in the forums. We will use combination of forum and Google Drive to do our work. We are basically crowdsourcing solutions. They will join us on build days and also add ideas to the forum. This will start happening probably next week. I just have to clean up the projects a bit on OSCE Days so that they are current and we will start using the forum on a weekly basis to design and build. it’s just a first impression coming back to the forum after a longish break… I have many more thoughts that are not quite clear yet. @Lars2i "The question is too complex, we ask too much, and give to little guidance. Yes, the topic is very complex, which is why there is such an chaotic, incoherent abundance of projects, talks and thoughts in the community. While I agree that it’s a task for us, the founders and permanently involved acitivists to keep an eye on it to make sure that OSCE is only used for things that really are OS and CE, I find it debatable what else ‘guidance’ should be. We ask a big question, but how can we give guidance while we are searching for the asnwers ourselves? Sure, we have discussed, what OSCE actually is, but as far as I remember it was a process that is not ended. I do agree that the documentation did not work well. Maybe we should make it conditional for participation that whatever is done needs to at least be uploaded as a picture with a short caption so people can see who has been working on what. People underestimate the power of documentation and are often not willing to invest the time. I suggest each event organizing group needs to have at least one person to be responsible for making people upload their information. I found that the ‘hackathon’-aspect was already stronger this year than last, at least in Berlin. But I would like to ask for more patience here. How can we start making things before we have considered WHAT WHY and HOW? That’s speaking from the experience of my own cyceloo-workshop. Last year there simply wasn’t anything to build yet as we needed to gather information first, this year we we were getting close to the second prototype. "rebuild everything – adjust the website, forum, READ ME etc." let’s have an offline talk about that in Berlin. I’d be happy to give some thoughts but find it hard to do so in writing. We need to do something to make the information remain accessible, and for that your template/ pre-structure idea makes sense. Maybe develop a kind of form for people to fill in when they plan and do their project that will allow us to present information on projects in a standardized and more networked way. “The OSCEdays Week” for presentation of results that were achieved during the year. This makes it possible to run events throughout the year and not to loose the one thing that started everything: The one big event in the year. Agree with Lars’ evaluation, but I would cut the Fails to one paragraph. Agree with all your feedback. Add the recipes for action, I prefer script/template/action plan, for me recipe means solutions and I believe what we are after is solutions, actionable solutions, to a set of challenges. Leave room for chaos, in other words, keep a balance between guidance, structure and creativity. I am very much against us becoming too corporate, I prefer the fluidity and participatory spirit of the makers/hackers/tinkerers that form our community. It does not mean that we should not aim for concrete achievements, it just means that we achieve them differently than in a rigid structure. Let’s remember, humans are in the situation of having to overhaul completely the way organize ourselves, because we have followed highly structured organizations working very efficiently on the wrong outcomes. Agree on the list of challenges/questions/problems for the community to work on in the next year. This will be one of the tasks of the new BoST. We establish the list and we ask the community to come up with solutions, in whichever way they prefer, with the demand that the solutions apply to OSCE, they are practical and implementable in the short to medium term. Documentation of local events is mandatory. One does not have time, will, whatever else, no problem, we move on. Ours is the kind of commons that does not succumb to “the tragedy of the commons”, but aims for the triumph of the commons. In other words, we expect complete reciprocity in everything we organize together. Sharing knowledge continuously on the forum, on all topics, is also expected or highly encouraged of everybody. Our goal is to make the Open Source Circular Economy a working model that displaces the current model that does damage and is obsolete, so it is this particular combination of two concepts that we are interested in, not each of them separately or with one weighted higher than the other. We want to celebrate and promote our successes, inspire others to join us, so please work on projects that achieve all or some of their stated goals in a reasonable timeframe: 0.5 - 2 years. All the activities taken under the umbrella of OSCEdays should promote our community and give it extended visibility in all your circles, business, academia, place, social, etc. We can’t make a change with 5 protocols. But with a procedure of inviting and creating practical action. With this open and growing list of protocols OSCEdays become richer and we keep the self-organizing part. I see myself for example inventing, testing and publishing several different protocols in the coming year. I created a draft for a future ‘Call For Local Event Organizers & Community Developer’. It outlines and facilitates a whole onboarding process that includes the forum and works without emailing and video calls. I am happy about feedback. I will bring it up in the next BoST Call. I have more stuff in the pipe that I will finish and post in the coming days/weeks. I am making good progress with developing the suggestions for the future strategy. To make the discussions easier I opened a new topic where I will post all the new stuff and where we can have propper discussions about it. Please visit there and give feedback. Following the discussion about the FUTURE and redesign of OSCEdays started in late August 2016 and the green light to start the building in the BoST call from September 5 2016 the rebuild of OSCEdays has begun. New things will be published below in the comments for feedback and discussion. Please join the discussion. Sorry for answer so late. i mean that one of the objectives of the platform and OSCED is work together, so i think that maybe can be mandatory that different cities work in one common project or theme and develop activities between them. im now reading the Rebuilding Oscedays documents.